THIS HOTEL IS 100PCT NON SMOKING The Hampton Inn Hartford/Airport hotel is located in Windsor CT one half mile from the Bradley International Airport which we offer complimentary shuttle service to and from 24-hours a day. Other local Hartford-area attractions include Six Flags New England Connecticut Convention Center Hartford Civic Center New England Air Museum MassMutual Center Mototown USA and the Basketball Hall of Fame. In addition to outstanding customer service Hampton Inn Hartford/Airport offers a complimentary On the House hot breakfast each morning and complimentary coffee and tea 24 hours a day in our lobby lounge. Take advantage of our indoor heated pool with whirlpool spa and our fully-equipped fitness center to stay in shape while away from home. Wireless Internet access is available in our lobby and first floor guess rooms and our 24-hour business center allows you to stay connected while away from the office. All guestrooms feature deluxe CloudNine bedding and linens complimentary high-speed Internet access iron and ironing board coffee maker hair dryer personal voicemail and a work desk with adjustable lighting. For a little extra pampering choose one of our King Whirlpool rooms. These rooms include all the amenities of our standard guestrooms plus a spacious and invigorating whirlpool tub. Our meeting room accommodates corporate groups up to 40 people and features a whiteboard projection screen and complimentary wireless Internet access. Additional A/V equipment and catering services are also available when arranged in advance. Ask about our Group Team and Special Package rates. Hilton HHonors Points - Miles are awarded for all qualifying stays and our 100 Hampton Guarantee is always in effect when staying at any Hampton hotel. 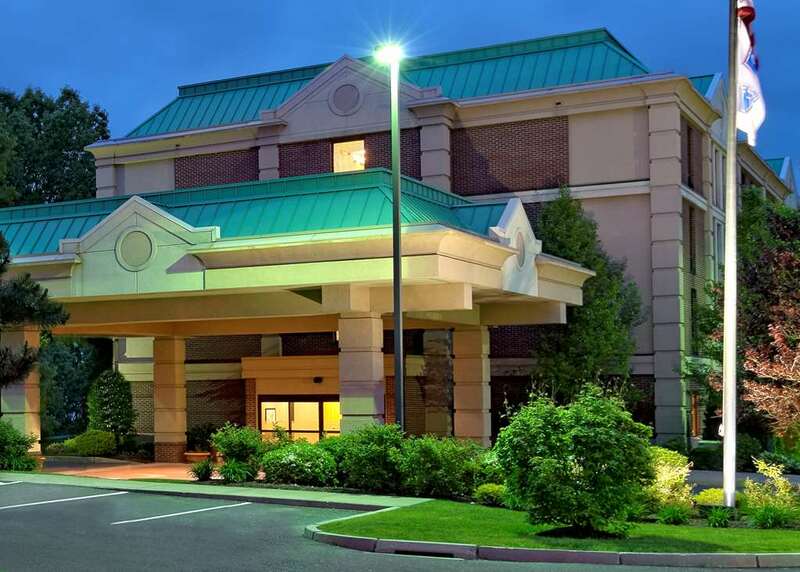 We love having you here in Connecticut at the Hampton Inn Harford Airport hotel.